Still on the fence about the 2018 Kansas Social Studies Conference? Not sure about meeting and listening to Joel Breakstone from the Stanford History Education Group share ways to engage kids in online civic literacy? Thinking about whether or not asking Don Gifford from KSDE questions about the new and improved state standards and assessments? Perhaps the free food and drinks at Sunday’s evening reception just hasn’t been enough to jumpstart your registration process. Maybe all you need is the chance to listen to a couple of the many awesome presenters who’ll be sharing their best stuff at the conference. Casey Krouse and Dylan Owings from Pleasant Ridge Middle School in Overland Park are asking their students to think about and solve authentic problems – like the problem facing the Pacific island country of Kiribati. Rising ocean levels are erasing areas of land and could soon engulf the entire nation. Their students are attacking the problem by using Design Thinking. During their conference presentation on Monday, October 29, 2018 at 10:30am, Casey and Dylan will share their lessons and instructional designs. So. Are you looking for a new way to address climate change in the classroom? Curious about the Design process? In their hands-on lessons, students work through Stanford’s Design Thinking Process to develop empathy for Pacific Islanders affected by sea level rise and engage in real world problem solving. Come learn more about how you can adapt their lessons to your classroom. Learn more about rising sea levels on Kiribati by viewing this CBS News overview. Then head over to the Kansas Social Studies conference site and get that registration started! If you’re on the fence about making the trip to Emporia for this year’s Kansas SocialStudies Conference, take a quick listen to a podcast from Buzzworthy Productions aka TJ Warsnak and Derek Schutte of Halstead High School. In this edition of The Social Hour podcast, TJ and Derek display their own unique flair while sharing excitement for the direction the discipline is taking, battling it out in a social studies most engaging project smackdown, and highlighting some of the topics they’ll be sharing during their session at the conference. The 2018 Kansas Social Studies conference targets the teaching and learning of historical thinking skills and assessments with a special focus on creating civically engaged students. In addition to TJ and Derek’s Buzzworthy Productions, there are over 45 breakout sessions during this year’s conference including keynotes by Joel Breakstone, executive director of the Stanford History Education Group. Joel will focus on SHEG’s latest online civic literacy tools and share tips and tricks for using their award winning lessons and assessments. The conference is October 28 and 29 at the Emporia State University student union. Get all the details and registration information at the conference website here. Can we combine civic engagement, technology and project based learning in a cohesive way? You bet we can, and when we do, our classes become more engaging. Check out our methods of how we combine these three components to expand learning opportunities and make your classes more buzzworthy. Hear about a new projects that can easily be integrated into your classes as well as how to use Google Sites as a basis for future designs. Join us for a a fun session full of ideas, laughs and some new teaching designs. PD Opportunity: Calling all teachers to the National WWII Museum! The National WWII Museum has an amazing opportunity for teachers this summer. Trust me, you won’t want to miss this! But hurry – the deadline for applications is February 1, 2018. Explore World War II in New Orleans and Hawaii! Applications for The National WWII Museum’s Summer Teacher Institute are now OPEN! This professional development experience for middle and high school social studies teachers includes a weeklong seminar at the Museum in New Orleans (July 22-28, 2018), plus a trip to explore WWII-related historic sites in and around Pearl Harbor, Hawaii (July 21-27, 2019). This year’s institute focuses on the US Home Front, and will include seminar discussions with top WWII scholars, guided tours of the Museum’s innovative exhibits, artifact analysis, and interaction with WWII veterans. Participants receive up to six hours of graduate credit for participation. Travel, graduate tuition, and seminar materials are provided free of charge by the Museum. For full details and the application, visit nationalww2museum.org/institute. If you have other questions, please contact Joshua Goodman at Joshua.Goodman@nationalww2museum.org. Hopefully you were able to join us at the Kansas Social Studies Conference earlier this month or were fortunate enough to get to attend National Council for the Social Studies annual conference in San Francisco just before Thanksgiving. If you’re already looking for your next social studies fix or haven’t had the opportunity yet, might I suggest a trip to Kansas City? Greetings, my fellow Kansans! With any luck the year has settled in for you. It has been a beautiful beginning, and the kids are just as wonderful as ever! My name is Jeff Benes and I am the Past President of the Missouri Council for the Social Studies. I live in Westwood, Kansas, but work in Gladstone, Missouri (be honest, how many of you had to Google those two locations). This school year, at the end of February, the Missouri Council is hosting our annual conference, and we wanted to reach out to you as neighbors and fellow teachers. 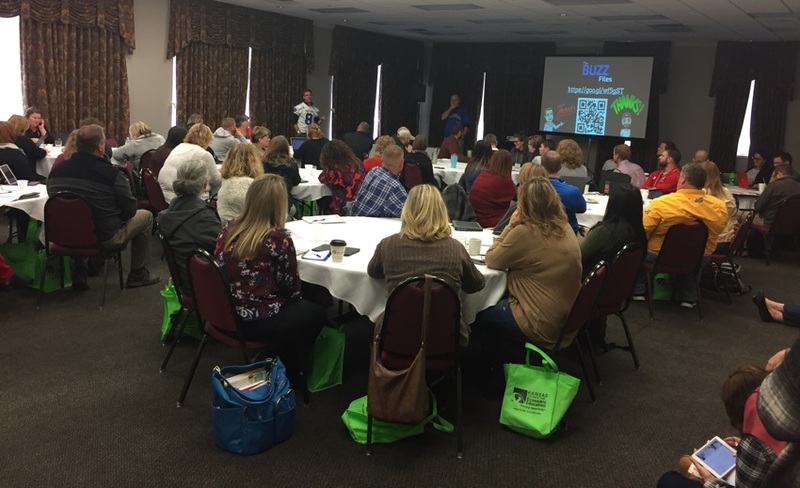 About 200 social studies teachers from around the state made their way to the Old Town Conference Center in downtown Wichita last Sunday and Monday for the annual state conference. If you were there, you know this already. If you were not there . . . well, you missed a lot of social studies awesome. Seriously. Make plans for next year. Great conversations. Great learning. Great networking. Great food. Great people. We know that Kansas does social studies a bit differently. Ever since 2013, when the latest state standards document was released, teachers in the state are being asked to focus on five major themes and historical thinking skills rather than just teaching a bunch of dates and places. It’s the balance between process and knowledge that we’re after. But doing things differently also extends to our state level conference. It seems that in most other states, the different social studies organizations host their own conferences. Econ here. Geo there. History somewhere else. Here in Kansas? The four major social studies groups – the Kansas Council for Economic Education, the Kansas Council for History Education, the Kansas Council for the Social Studies, and the Kansas Geographic Alliance – all work together to host one conference a year. With the support and encouragement of the Kansas Department of Education, this makes it easier for K-12 teachers to find us all in the same place and increases the cumulative social studies goodness.